After being crowned Forecourt Retailer of the year last October, the business model of innovative progression and flexible development in service station satisfaction is certainly starting to catch the eye across both the UK and Europe. In an in-depth interview with Europe & Middle East Outlook magazine, Sales Director, Joe Brough discusses and outlines the family history associated with the business along with discussing numerous topics on investment, strategic partners and future business goals of the business. Europe & Middle Outlook magazine is a bi-monthly magazine embracing the coverage of key business sectors in oil and gas, construction, retail and a number of other profession service sectors across Europe and the middle east. 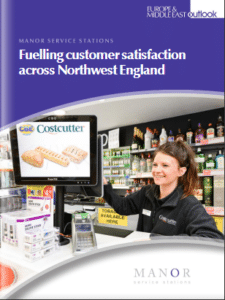 You can also view the brand new Manor Service Stations marketing brochure here.